The Arm Curl Bench allows you to put more intensity into working your biceps. It is built with comfort, function, and durability in mind, allowing arm work to be completed using proper form. Six different arm rest adjustments designed to fit your body. •Dumbbells and Weights not included. 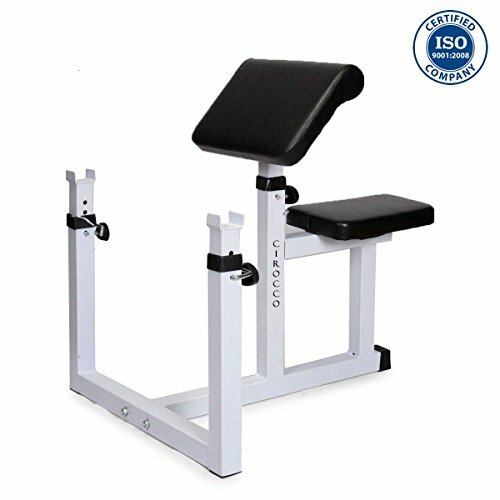 •Tube size Thickness of the pad: 2"
•Size of the Pads: 16" x 12" , 14" x 9.5"
Whole Size: 28.5"(L) x 30"(W) x 35"(H) Bar rest adjustment: 18" - 22"(H). Tube size Thickness of the pad: 2"
Size of the Pads: 16" x 12", 14" x 9.5"